This delicious Earthen cake is a perfect addition to any Christmas party table. Fans of the green tea and coffee combo will love this recipe. Line three 23x33cm (9x13”) rectangular baking trays with greaseproof paper or silicone sheet. Preheat oven to 180°C. Sift flour, cornflour and ground almond together. Whisk eggs and sugar until thick, pale and fluffy. Fold in sifted dry ingredients and then add warm melted butter and mix thoroughly but lightly. Divide the mixture into three portions. Mix one portion with coffee, another with green tea, and the last with chocolate. Pour the flavoured mixtures into the three separate baking trays, smoothen with spatula and bake for 8 minutes. Unmould and cover with cling film. Repeat the above process to make a second batch. In a saucepan, combine the sugar and water; split the vanilla pod and scrape the seeds. Boil until sugar dissolves. Al-low to cool. Split the vanilla pod and scrape seeds into the cream and whip together until soft peaks form. In a stand mixer with the paddle attachment, mix all ingredients together on low speed to a grainy (crumbly) texture. Bake at 160°C for 12 minutes. Using a pastry brush, apply the vanilla syrup on each layer of sponge. Then spread 160g of whipped cream on each sponge layer and stack them up. Freeze for 4 hours. Cut the cake into three 23x11cm (9x4”) rectangles, and give them a 90° turn so that the lines are vertical. 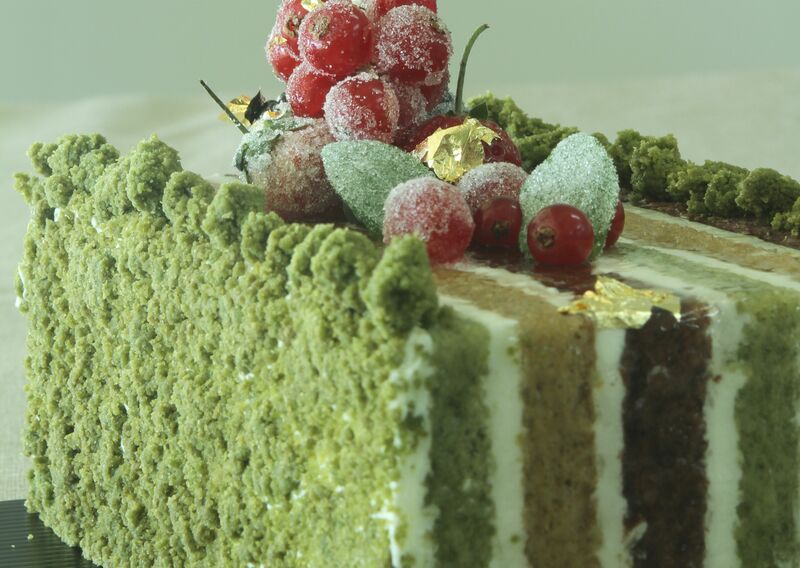 Coat both sides of the cake with green tea crumble and brush the top and ends with colourless glaze. Decorate as desired.